Kerry: ISIS targeting airports because it's "desperate"
ASPEN, Colo. -- While there was no immediate claim of responsibility for Tuesday's attack at the Istanbul airport which killed at least 36 people and wounded nearly 150 others, Turkish and U.S. officials said it was likely the work of ISIS. Speaking Tuesday evening at the Aspen Ideas Festival, Secretary of State Kerry said the fact that ISIS is targeting airports is a sign of weakness by the terror group, which he referred to by the name Daesh. "It has been more than one year since Daesh has actually launched a full scale military offensive, and that's because our coalition is moving relentlessly on every front," Kerry said. Witnesses say Christmas market killer on loose shouted "Allahu Akbar"
"Now, yes, you can bomb an airport, you can blow yourself up. That's the tragedy," he continued. "Daesh and others like it know that we have to get it right 24/7/365. They have to get it right for ten minutes or one hour, so it's a very different scale." 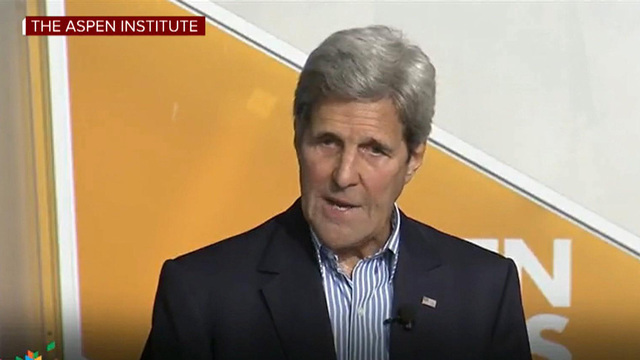 Kerry continued, "And if you're desperate and if you know you are losing, and you know you want to give up your life, then obviously you can do some harm." "We are still collecting information and trying to ascertain what happened and who did it and I won't comment further on it except to say that this is daily fare and that's why I say the first challenge we need to face is countering non-state violent actors, for a host of reasons," Kerry said. Terrorist linked to or inspired by ISIS were responsible for the Brussels bombings at the city's airport and a subway station in March and the Paris attacks last November.